This Valentine’s Day, surprise your sweetheart with an unforgettable homemade dinner. Valentine’s Day is about showing your sweetie how much you care. Why not wrap up Cupid’s day of love with a NY strip just like the one we serve at Harry’s. 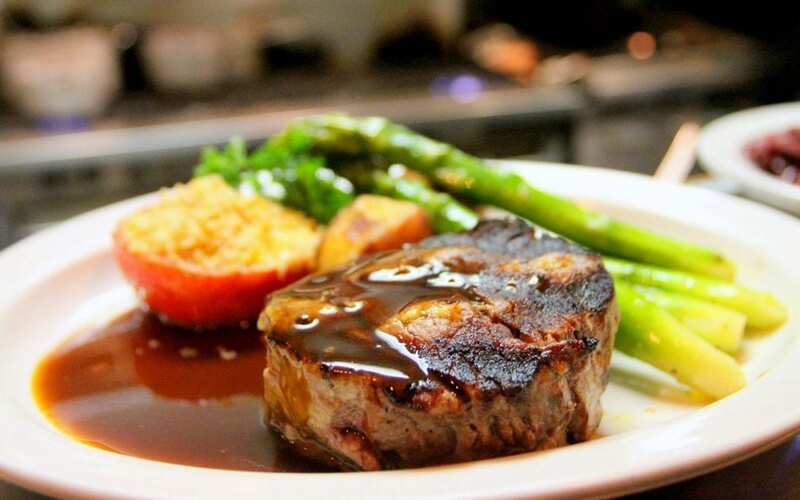 At Harry’s, our NY strip is served with garlic mashed potatoes and seasonal vegetables. In this post we’ll make roasted asparagus. Blend butter, blue cheese, garlic, and pepper in a medium bowl. A fork is a good tool for doing this but you can also use a hand mixer. Pack the butter in a small container and refrigerate until you’re ready to use. Butter may be made several days in advance and even frozen. Let the steaks stand at room temperature for 30 minutes before grilling. Brush olive oil on both sides and season generously with salt and pepper. Oil your grill or pan. Preheat until hot – a few minutes – to ensure a good sear. Place the steaks on your pan or grill and cook for 4 to 5 minutes per side for medium-rare. If you want a medium cook, add a minute or two to each side. Subtract a minute or two for rare. Remove steaks from heat and let rest for 5 minutes. Smear at a tablespoon of butter over each steak and serve. Peel and dice potatoes so that each piece is roughly the same size. In a large saucepan, add the potatoes and salt, then cover with water. Bring to a boil over and then reduce heat to maintain a rolling boil. Cook until potatoes fall apart with a fork. Then, in a medium saucepan, heat the half-and-half and garlic over medium heat until simmering. Remove from heat and set aside. Drain the potatoes then mash and add the garlic-cream mixture and Parmesan. Stir until combined. Place the asparagus in a mixing bowl with the olive oil. Toss to coat, then sprinkle with Parmesan cheese, garlic, salt, and pepper. Bake in the preheated oven until tender, 12 to 15 minutes depending on thickness. Sprinkle with lemon juice just before serving. To finish, plate and garnish your choice of herbs. There you have it. A simple and delicious way to wow your Valentine this year. And, don’t forget, visit us May through October for great food, drink, live music and much more!